Asthalin Inhaler is used to treat or prevent bronchospasm in people with reversible obstructive airway disease and also used to prevent exercise-induced bronchospasm. It is a bronchodilator that relaxes muscles in the airways and increases air flow to the lungs. Asthalin Inhalers are available as canisters containing 200 metered doses. Each actuation delivers Albuterol Sulphate IP equivalent to 100 mcg of Salbutamol. We also have in stock Generic Symbicort (Foracort Inhaler), another medication which is also used to treat asthma. 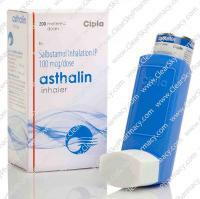 We supply Asthalin Inhaler, manufactured by Cipla which is also known as generic ProAir. It contains the active ingredient Albuterol. Albuterol is the same as Salbutermol, just a different name in different countries. 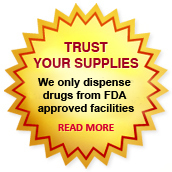 It is available in strength of 100 mcg and containing 200 metered dosages. Asthalin inhaler is used for the treatment or prevention of bronchospasm in patients 4 years of age and older with reversible obstructive airway disease. It is also used for the prevention of exercise-induced bronchospasm in patients 4 years of age and older. Use Asthalin inhaler (Generic ProAir) exactly as it was prescribed for you. Do not use Asthalin (Generic ProAir) in larger amounts, or use it for longer than recommended by your doctor. Talk with your doctor about your individual risks and benefits of using Asthalin (Generic ProAir). When using the inhaler device for the first time, prime it by spraying 4 test sprays into the air, away from your face. Shake well before priming. Also prime the inhaler if you have not used it for 2 weeks or longer, or if you have dropped the inhaler. The instructions below are for standard use of the inhaler and nebulizer devices. Your doctor may want you to use your device differently. Shake the canister well just before each spray. Uncap the mouthpiece of the inhaler. Breathe out fully. Put the mouthpiece into your mouth and close your lips. Breathe in slowly while pushing down on the canister. Hold your breath for 10 seconds, and then breathe out slowly. Call your doctor right away if you feel that Asthalin (Generic ProAir) is not working as well as usual, or if it makes your condition worse. If it seems like you need to use more of any of your medications in a 24-hour period, talk with your doctor. It is important to keep this medication on hand at all times. Get your prescription refilled before you run out of medicine completely. Keep using all of your other medications as prescribed by your doctor. 1 or 2 puffs as necessary. The maximum dose is up to 8 puffs in 24 hours. Two inhalations, 15 minutes prior to exercise or exposure to allergen. The maximum dose is 2 puffs, up to 4 times a day. In case you miss a dose of Asthalin (Generic ProAir), administer it as soon as you remember. If it is almost time for the next dose, skip the missed dose and use the medicine at the next regularly scheduled time. Do not use extra medicine to make up the missed dose. Stop using Asthalin (Generic ProAir) and get emergency medical help if you have any signs of an allergic reaction including hives, difficulty breathing, or swelling of your face, lips, tongue, or throat. An overdose of Asthalin (Generic ProAir) can be fatal. Overdose symptoms may include nervousness, headache, tremor, dry mouth, chest pain or heavy feeling, rapid or uneven heart rate, pain spreading to the arm or shoulder, nausea, sweating, dizziness, seizure (convulsions), feeling light-headed, or fainting. Asthalin Inhaler (Generic ProAir) is contraindicated in patients with a hypersensitivity to Albuterol Sulphate or any of the inactive ingredients present in the medication. If you have certain conditions, you may need a dose adjustment or special tests to safely use this medication. It may increase the risk of asthma-related death. Use only the prescribed dose of this medicine. Below are mentioned Warnings and Precautions associated with Asthalin Inhaler use. Inhaled Albuterol sulphate can produce paradoxical bronchospasm, which can be life-threatening. In case, paradoxical bronchospasm occurs, Asthalin Inhaler should be discontinued immediately and alternative therapy instituted. Asthalin HFA , like all other beta-adrenergic agonists, can produce clinically significant cardiovascular effects in certain patients as measured by pulse rate, blood pressure, and/or symptoms. Although such effects are rare after administration of Albuterol Sulphate Inhaler at recommended doses, in case they occur, use of Asthalin Inhaler may need to be stopped. Asthma could deteriorate acutely over a period of hours or chronically over several days or longer. If the patient needs more doses of Asthalin than usual, this may be a symptom of destabilization of asthma and requires re-evaluation of the patient and treatment regimen. The use of beta-adrenergic agonist bronchodilators alone may not be sufficient to control asthma in many patients. Consideration should be given to this as soon as possible and the possibility of adding anti-inflammatory agents, e.g., corticosteroids, to the therapeutic regimen. Deaths have been reported in association with excessive use of inhaled sympathomimetic medicines in patients with asthma. The exact cause of death is not known, but cardiac arrest following an unexpected development of a severe acute asthmatic crisis and subsequent hypoxia is suspected. FDA pregnancy category C. This medicine may be harmful to an unborn baby. Tell your doctor if you are pregnant or plan to become pregnant during treatment. It is not known whether this medicine passes into breast milk or if it could harm a nursing baby. Do not use this medicine without telling your doctor if you are breast-feeding a baby. You can buy Asthalin Inhaler (Generic ProAir) online from Clear Sky Pharmacy. Asthalin Inhaler manufactured by Cipla, India are supplied in a strength of 100 mcg. Each inhaler contains 200 metered doses. The inhaler costs only $12.08 per unit when you place an order for 16 inhalers.